I hope you are all enjoying your weekend! 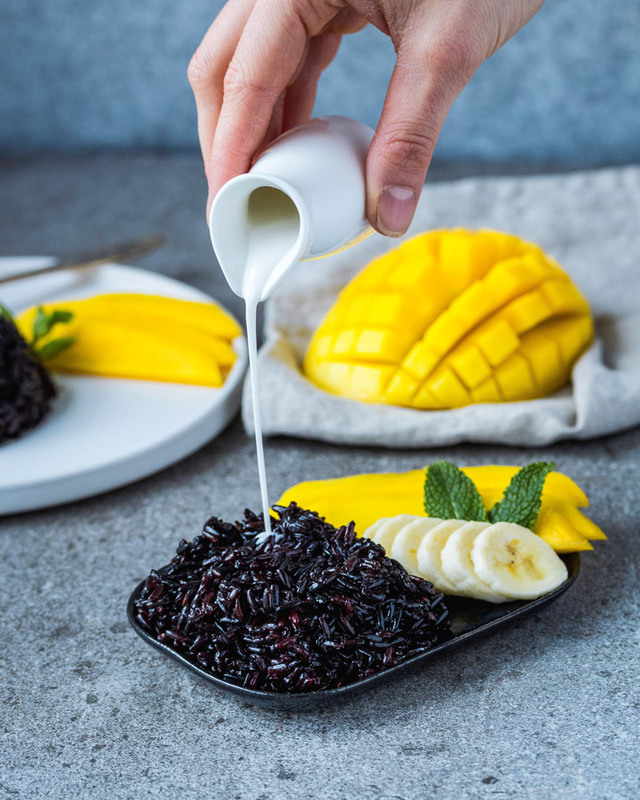 Hands up if you have ever been to Thailand and have tried Mango and Sticky Rice? Well, I must confess I haven´t been to Thailand yet but my boyfriend Philipp has and since then he has been craving it ever since. We have planned to make it at home for ages. The time has finally come now. You need a bamboo or a vegetable metal steamer for it. We have a metal one from Ikea, it was super cheap and perfect for steaming veggies as well. Making sticky rice is not difficult if you follow my recipe and make sure to purchase the proper sticky rice. It won´t work with basmati rice, nor with sushi rice. Nope. I wish it would. We have an Asian supermarket just around the corner so we are spoiled. If you don´t have one in your town, then order your rice *here. It´s worth it. 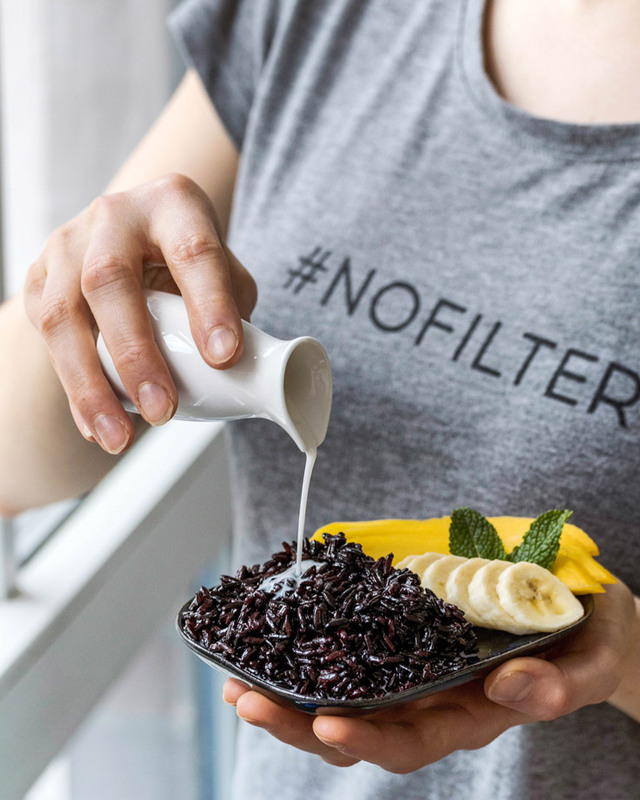 We used black sticky rice but white is also perfect. I recommend using *Aroy-D coconut milk, it is just the best coconut milk I know. We also served it with some bananas but that is not a must. Make sure to buy ripe mangos! I am a huge mango lover! Who else? Now just follow the instructions and enjoy your Thai dessert. Leave me a comment with your experience. Soak your rice in the water over night or at least for 8 hours. and steam it for 20-30 minutes. Make sure to add more water when necessary. For the sauce boil your coconut milk in a wok pan. Add sugar to taste and a tiny bit of salt. Put half of your coconut milk in a bowl. Now spoon your rice into the wok pan where your coconut milk is. Warm it up. Serve immediately and pour more warm coconut milk on your rice. Serve with freshly sliced ripe mango slices and with bananas. You cannot stop eating it, it is so good! If you are using Pinterest, feel free the pin this photo. If you make my recipes and would like me to see them on Instagram, then please use my hashtag #yolcsitaeats oder tag me in the caption! Thank you! ? *This is an Affiliate Link. Using this link I will earn a small amount of commission but the price will stay the same for you. This sounds heaven! 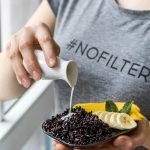 I love black sticky rice and I should definitely try this out! Thank you so much Nele! ?